In celebration of the 50th anniversary of the SETI project, and SETI pioneer Frank Drake’s 80th birthday, the SETI Institute is throwing party/convention called SETIcon. 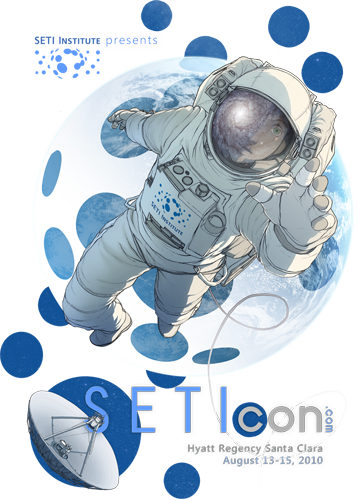 Held over 3 days (August 13-15) at the Hyatt Regency Santa Clara, this year’s SETIcon will include 4 tracks of programming for a variety of audiences interested in space exploration, astronomy, and SETI. The National Center for Atmospheric Research (NCAR) today released new video of a fluid simulation scenario showing oil from the BP disaster moving into the Atlantic Ocean as early as 80 days after it was spilled, or sometime in July. BP is providing this live video from one of the ROV assisting in the “top kill” procedure. Early Saturday morning, a magnitude 8.8 earthquake struck off the coast of Chile near the town of Maule. The earthquake generated a tsunami, and much of the Pacific Basin was placed on alert for a possibly severe tsunami. According to a email sent by the Alex Zwissler, Executive Director/CEO of the Chabot Space & Science Center to members of the Mount Diablo Astronomical Society, a proposed City of Oakland FY 2010-11 budget will include drastic cuts in the City of Oakland’s contribution to the Chabot. [ February 9, 2010; 6:30 pm to 7:30 pm. ] This month’s Cafe Scientifique is on a topic close to the hearts of almost every Californian: water. Here’s a list of events around the Bay Area for those looking to mix a little science with pleasure this Valentine’s Day season. [ February 4, 2010; 6:00 pm to 10:00 pm. ] Valentine’s Day comes a little early as the Exploratorium gets Cinemax’d up and becomes the Sexploratorium for this month’s After Dark program.